ex-Goldman Sachs executive, Chairman of Commodity Futures Trading Commission. 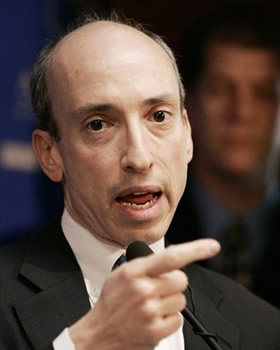 Gary Gensler served as Treasury Under Secretary for Domestic Finance after being Assistant Secretary for Financial Markets from 1997 to 2001. He subsequently acted as Senior Advisor to Senator Paul Sarbanes, on the Sarbanes-Oxley Act. Prior to this, he spent 18 years at Goldman Sachs, as a partner for nine years and later as co-head of finance.